Sprint's new BlackBerry Curve colors and BlackBerry Tour | BlackBerry Blast! We reported yesterday that Sprint was going to launch inferno orange and red BlackBerry Curves and now the pictures are coming out. 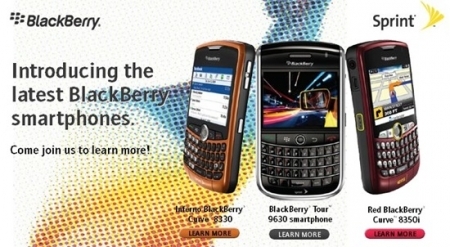 CrackBerry published this ad showing BlackBerry devices headed for Sprint. It seems like most people would go for the BlackBerry Tour, but new colors are always nice.